Singers often write to me about the various troubles they are having with their voices - often from over use. 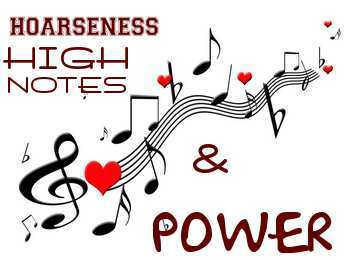 They experience hoarseness - or a loss of high notes - or an inability to sing with enough power (without strain....). This week, I decided to make a return visit to speak with two voice experts with whom I had spoken two years ago: the speech therapist, Glenna Waters, and a unique long-time teacher of and author about - singing, Meribeth Dayme. Glenna Waters, (see sore throat remedies! ), and I spoke about her continuing confidence in a set of exercises that her practice has shown her can help singers with, (among other things,) hoarseness, lack of high notes, diminished power and those who are recovering from vocal nodules. I share some of what she said here below. 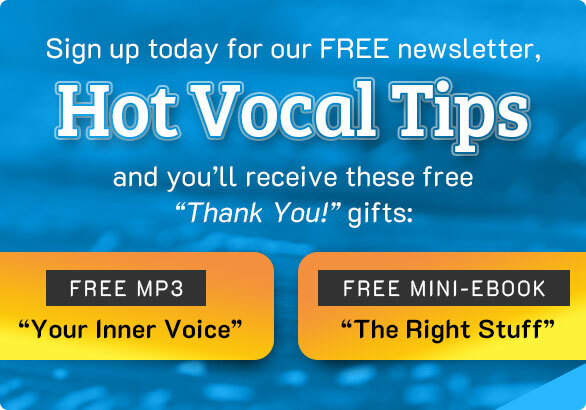 Watch for more detail coming in an E-Guide that will be available in my Gift Shop about ways to maintain a healthy and well-functioning throat & improve singing. 1. The long held Neeeee exercise on F above middle C.
(Men can do it an octave lower.) The idea is to hold the note softly, as long as you can, without forcing the tone and with well placed resonance. Stemple's research shows that these two and the other exercises he has compiled will help to re-balance the vocal folds so that, among other benefits, your singing is easier and your sound is more clear and focussed. NOW WATCH THIS VIDEO TO SEE MR. STEMPLE IN ACTION! In this video you will see a sample of Stemple's work with a singer who is learning how NOT to "sing" the exercises. In other words, Stemple is not looking for a pretty tone. He wants this to be a "physical exercise" for the vocal mechanism: to re-learn how to move through your whole range with no breaks. Glenna Waters told me that she uses these exercises for many different kinds of vocal problems. And though she did not claim it, I suspect that singers who use these exercises daily, will find their voices in better and better shape. In my own singing and teaching experience, I find that the gliding exercise (from lowest to highest notes), helps to open up the top for some singers who find it hard to even imagine singing that high. Meribeth Dayme is a long time vocal expert. She has taught singing and vocal pedagogy in university and privately for over 35 years and is well-known for her textbooks on singing, her master classes and courses. She states that: "We live in a kind of pea-soup of energies moving around us, in and out of us all the time. Because singing is a vibration, an energy, this makes it easier to look at the art in broader terms." Right now, Meribeth is offering 15-minute CoreSinging® taster sessions via Skype between May 20 and June 20th. So I scheduled a session for myself with her. Here are a few notes from that intriguing sample! Meribeth has said: "Singing is not a sport, but it uses that physical aspect and we don’t often enough go outside of the field of singing to learn–and that is where we are really remiss. For instance, I use a lot of Qigong and Taichi because they are things that move smoothly, they are musical and they use a different energy system than we are used to." - The first idea was a way of breathing (imagining the movement of energy - from base of spine to top of head and back down) that, to my mind, helped to focus and ground my body - and thus, my sound. - The second idea had me chewing on my lyrics (not singing) in a way that loosened my jaw, tongue, lips and throat. And even more importantly, made me laugh out loud! 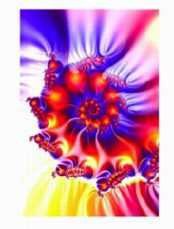 - The third idea had me shifting the way I was standing to take on a more energetically powerful position. "People are not grounded at all in the way they are taught to sing, she said." "They come up out of themselves, instead of down into themselves - and they block the flow of their own chi."